One big win and, in heavyweight boxing, a fighter can find himself right back at the top. And David Price, who we all know needs a big win if he’s to remain relevant, looks all set to get this kind of chance in March. Promoter Eddie Hearn hopes this week to be able to officially announce David Price Vs. Alexander Povetkin for the under-card of the March 31 heavyweight unification showdown between WBA/IBF champ Anthony Joshua and WBO ruler Joseph Parker. According to a news story via Sky Sports, Povetkin has now agreed terms for the fight; Price having accepted the fight a while back. It’s an interesting fight to be sure, and Price can, as Hearn says, punch very hard. 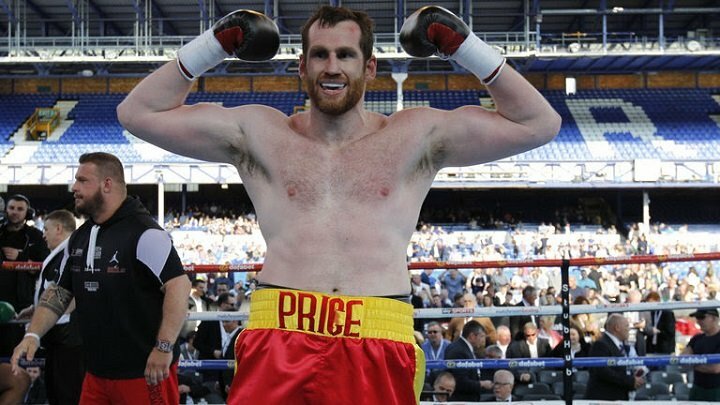 Imagine if, after all he’s been through – those nasty losses to Tony Thompson, Erkan Teper and, most recently, Christian Hammer – Price pulled out one massive win and took over from once-beaten Russian star Povetkin as the mandatory for Joshua’s WBA belt! Fans will not feel Price has too much of a chance of pulling off the upset of course – Price has had too many so-called panic/anxiety attacks in the ring both before and during a fight and his chin has let him down also – and most will pick Povetkin to pick up a relatively straightforward stoppage win. It’s strange in a way why Povetkin has taken this fight though. Of course he feels he will win and that he has nothing much to worry about and will pick up a nice pay day, but what else would Povetkin really gain from a win over a man everyone expects him to beat? And then of course there is the chance, however small, that the towering Price lands a bomb on Povetkin’s chin and flattens him. As supporting bouts go, especially heavyweight ones, this fight is not bad – certainly not from a point of intrigue. Who will you be rooting for?